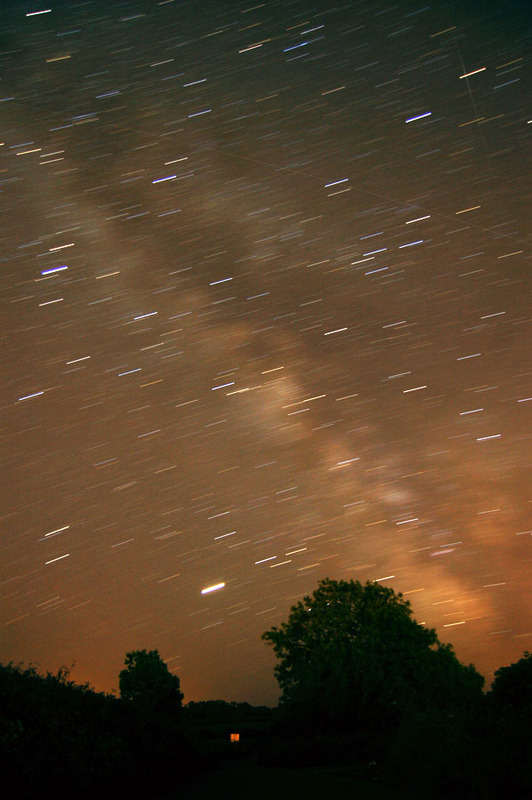 This page is intended for night sky pictures taken with just my Nikon DSLR camera and tripod. Please see the Astro page for night sky imaging using my telescope and electronic tracking etc. First NLC of the season for me, and judging by the activity this season could yield a lot of displays. This was after a session of Milky Way pics and as we headed back to the car park it became obvious there was that extra-special glow of NLC on the northern horizon, so I went straight down to the beach and got this picture about the peek of activity at 3:34am. 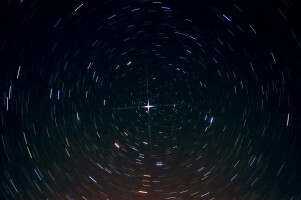 The bright star upper right is Capella (alpha Auriga) which is the guide star for judging the height of the display, so this one was confined well below. We got up to Coleton about 3am which was too late for the dark skies, missed a good opportunity, but used my new speedlight to take a rear-flash selfie! Start Point lighthouse and Daymark bottom right. Second Milky Way session the day after the picture below, not quite as good conditions but still managed to get some decent images to play with. Using my torch to light the gate in the foreground, you can just see the Darkmark in the bottom right. Got a satellite flare to the left (not a meteor). This was the first proper shot I took on arrival at the car park that night, 30 seconds at ISO400, perfect conditions with very good visibility and humidity in the 70% range. I’ve had a few different approaches at this in Lightroom and eventually managed to get what I think is a very natural image; preserving the star colours and getting some magenta from the Lagoon nebula. The bright reddish dot at the very bottom is Mars, sitting in a little bit of light pollution coming all the way from France and the Channel Islands! 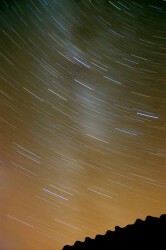 This is a 30 minute exposure from 11:30pm while sitting on the river bank enjoying a bottle of wine. The light pollution isn’t ideal and I’ve kept the orange colour to preserve the star colours and keep it natural and realistic. You can just see the lime-kiln under the tree’s on the left, a satellite trails through the right-side, the glow of Plymouth and Totnes back-lighting the distant terrain. Early May 2018 – Out testing my new lens as much as possible, this was taken under heavy light pollution very near a main road; headlights from traffic a few hundred meters away washing across the trees. Still I made it a challenge to make a shot using my new Gorillapod mini tripod which I love; great lightweight and very versatile tool; ideal for walks. This is pretty much straight from the camera. 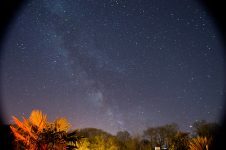 Never expected to get useful pictures of the Milky Way from home really; but last night was a particularly clear one. 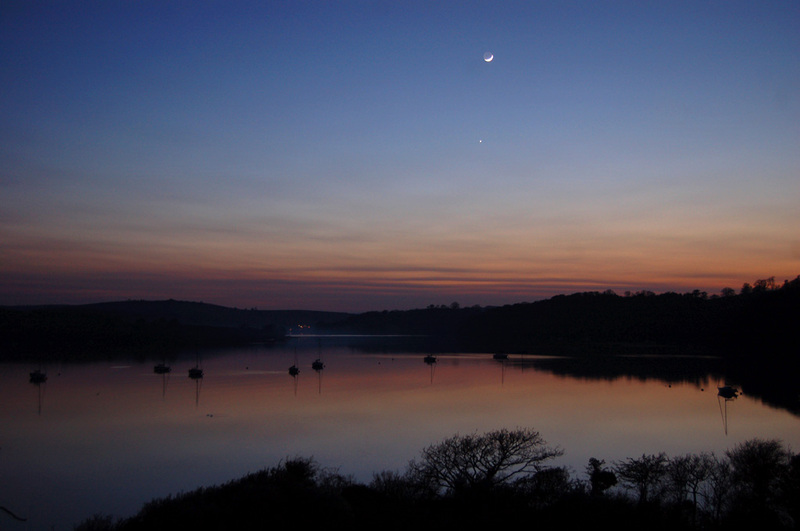 Two of the bright star-like objects bottom right are Saturn and Mars. Various exposure times and ISO’s trying to make something work. Cheep wide-angle adapter screwed on the end as usual; pretty essential for this to get more sky in the shot, and more of the foreground which shows the woods and our palm tree’s. 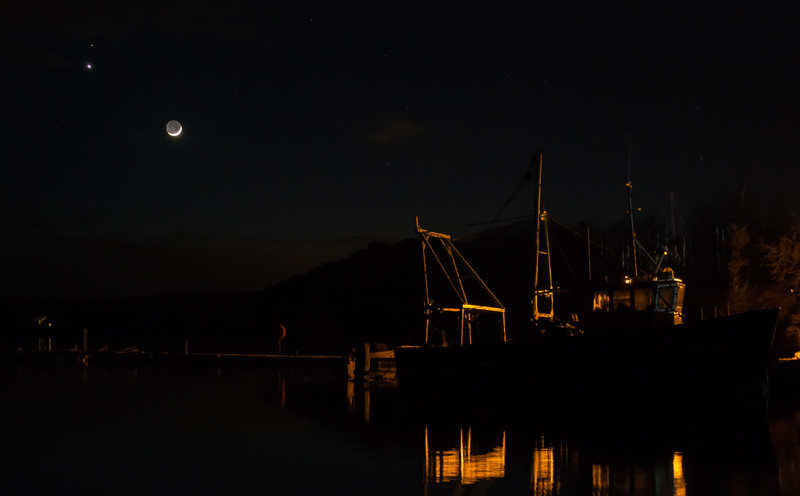 I don’t like to miss a good conjunction so I went down to the usual location at Galmpton Creek on the River Dart, same as several other images below. The natural lighting was very dark by the time Mars was nicely visible and the conjunction was low enough to make a nice image; thus not much sunset left, this means my kit lens really struggled and higher ISO’s were required, thankfully RAW tools can help make something worthwhile. I had a bit of a fight with color profiles with this image too, for some reason Photoshop wasn’t applying a profile to the image so it was rendered much darker once in a web browser. It’s still got something wrong with it, you should be able to see some detail to the hull of the boat when viewing the full-size picture; but some monitors show it totally black, all a bit strange. I happened to walk through the house at about 3am and couldn’t help notice the ghostly white light coming from the dawn direction, within moments my photography head was on and my tripod was peeking out of the velux window in our loft. 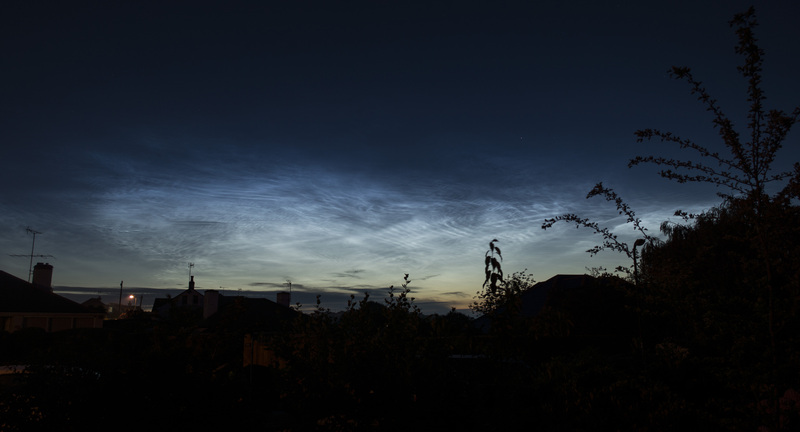 Noctilucent cloud is best when it is still mostly dark and I managed to catch that this time, it’s certainly a much stronger display than the shots further down this page. Nikon D3200 with Nikkor 300mm and Nikon 18-52mm, one single image and two Photoshop photomerge panoramas, little bit of raw processing to make the best of them. These are very high-res pictures, it’s worth right clicking and use “Save link as…” to download the full size image, (or “Open link in new tab/window”). 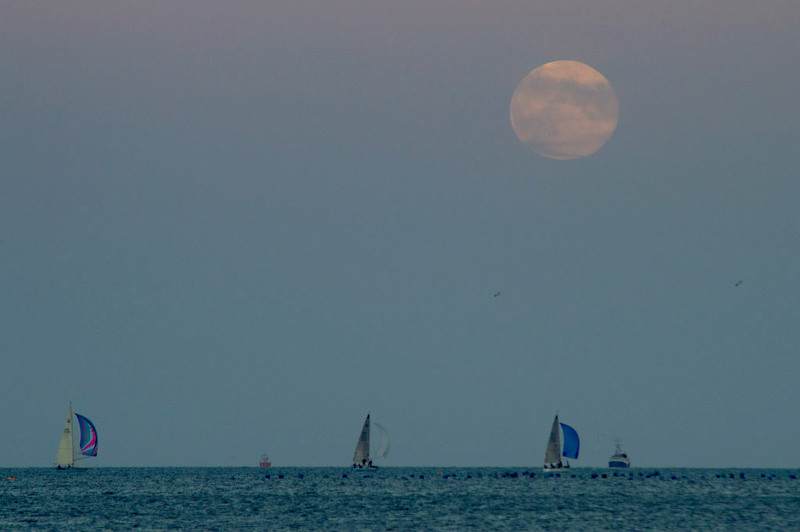 I got the NASA news feed about the Harvest Moon, and along with some chat in the Nikonites forum I set about getting one of those epic long focal-length images with a distant object like Brixham Lighthouse on top of a huge Moon on the horizon. I planned it well and got into position, but despite clear skies above; the Moon was hidden behind a distant cloud bank right on the horizon and didn’t become visible for a while, so the main objective will have to wait for another day. Still; these images are quite nice and made it worthwhile. For one reason or another we have never had much luck when it comes to the Perseids, either the weather rolls in and ruins it; or I point my camera at an area of sky and despite shooting loads of images I get no success. This year was different, I drove up to Hillhead for a look and initially it was pretty cloudy; but given some clarity near Perseus I decided to get the camera and tripod out. The first image here was the third image I took; and there was still a lot of cloud around; coloured orange by the streetlights of Torbay – but I have caught a pretty bright fireball; so bright it’s actually over-exposed using ISO800; I reduced that a little with RAW exposure compensation. I then had a bit of a drought in getting more meteors; and since I have a new camera to test I decided to do a 10min trail of the Cygnus rift area, my focus was great and the sky was pretty clear so it’s not a bad image; but still I’m too close to Torbay to avoid the orange hue. I haven’t used any noise reduction on these either, I need to take some dark frames to use for subtraction. Back over to the north facing Perseus for a few more attempts; lucky for me I got a longer meteor streaking passed the famous Pleiades cluster; or the Seven Sisters as it’s known. 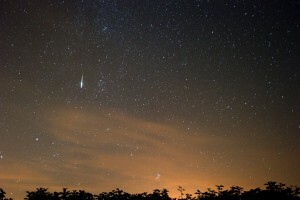 Overall I am very pleased to have got my first meteors on film (file) and was very glad I made the effort. It’s plainly the season for NLC’s now, after the amazing display a few days ago I am now checking every day as the weather has been great. There was no sign of anything all evening, but then at about 3am the sky started to glow with ghostly white wisps once more, so off to the beach I went. This time I made sure my focus was bang on and I purposely took images to make a panorama from, photoshop’s merge tools did a great job so I didn’t really have to do much manual work. Also I haven’t adjusted the levels and contrast so much this time perhaps making for a more natural image. We had been out with telescopes making use of the excellent ‘seeing’ conditions and the absence of streetlights past 2am (yay! 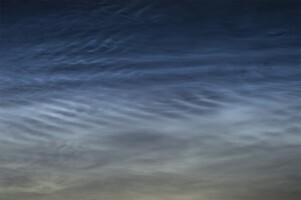 ), I was just leaving when the dawn twilight in the north caught my attention and I immediately realized there was something special – noctilucent clouds. For several years now I have been looking out for them and had never seen such as a hint before, so within seconds I was racing home to get the camera and head down to Broadsands beach for a better look. 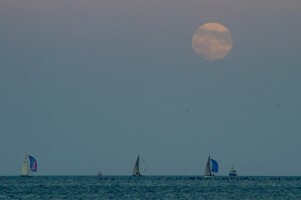 Somehow this image had been stored away after editing and never made it to the website until now (July 2011). 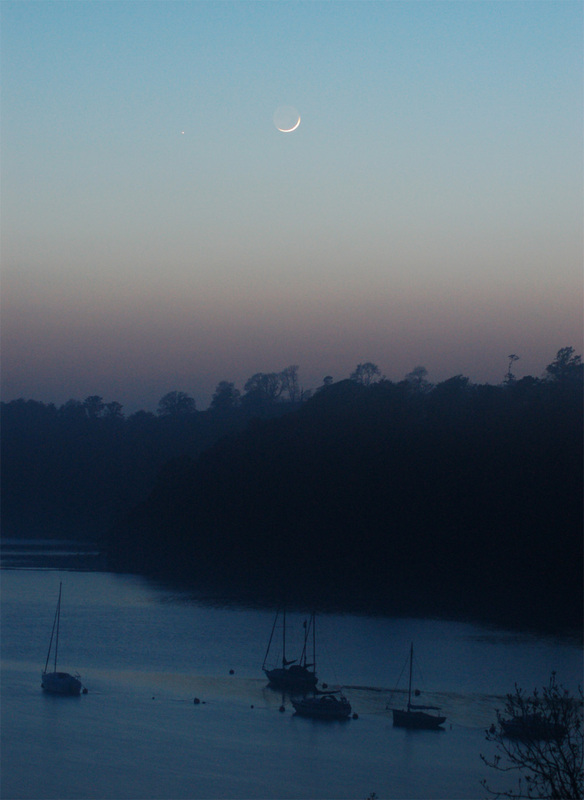 A conjunction of a newish Moon and the bright planet Venus, taken from one of our very best secret spots overlooking the River Dart, a location you will see in many of my images since its one of our best westerly facing views. I can’t remember now but looking at the noise in the image I’d say it may have been a test of higher ISO values, normally I should be able to get the dark areas cleaner that this, but either way I think it captures the setting well. I love the distant lights of Dittisham through the smoky air up river. I haven’t done anything special for this page during 2009 but thought I should post the best of what there was. 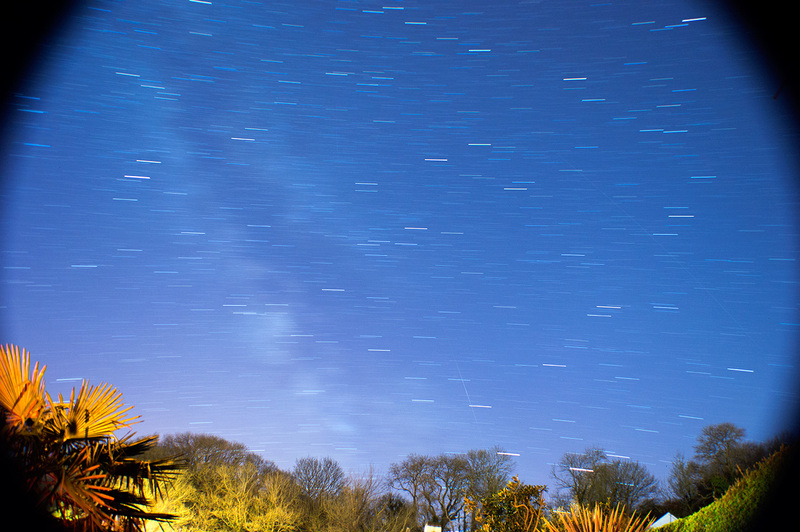 Firstly, a 30 minute star trail taken from a friend’s back garden under pretty dark skies near Buckfast (just within Dartmoor). 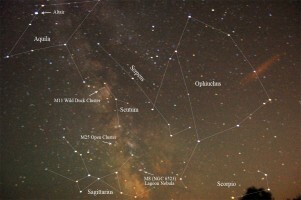 This image shows the cloudy patches of Milky Way through Cygnus down into Aquila below, the wobbly corner object is a corrugated shed roof. 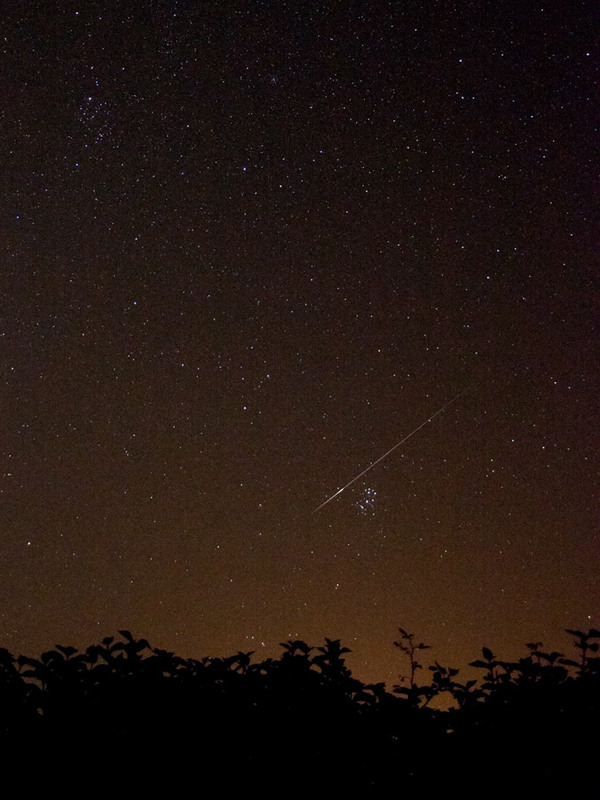 The second picture was the only decent image from a session trying to capture a geminid meteor; which didn’t happen! 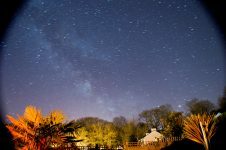 This was taken from my back garden at home which has too much light pollution for imaging really; thus I had to be hard with levels and also used a blue cooling filter to reduce the orange glow. 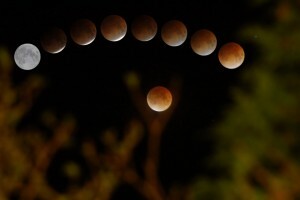 Both these pictures were taken using only standard equipment; the camera mounted on a tripod with the default 18mm lens at minimum F-number of 4.5. Normally I don’t like to sacrifice ISO for more light but with the Orion picture I was at ISO800 for a short 30 second exposure to keep trailing to a minimum. 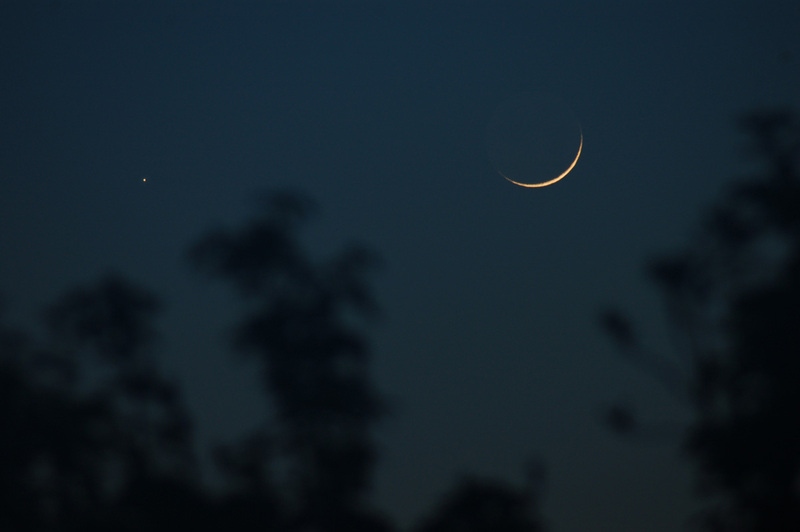 I always love seeing brilliant Venus in the evening sky and even better with Jupiter near-by, but this particular evening we had a nice photo opportunity with a 3 day old Moon occulting (passing in front of) Venus and then moving away before they all set below the horizon. 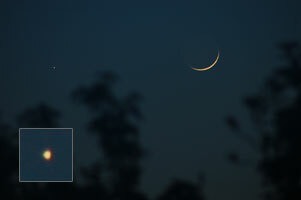 These pictures were taken in the order shown, firstly the Moon was visible in broad daylight but as the Sunset Jupiter soon showed up (top right). Watching through binoculars we waited until eventually the super-bright point of light that is Venus came out from behind the Moon, a wonderful sight. I had hoped to get a better foreground but hadn’t anticipated that it was going to go pitch black before they were low enough, fortunately the cars on the dual-carriageway conveniently turned into streaks due to the exposure times so that helped. 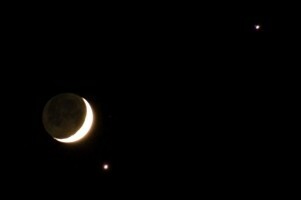 If you look closely at the zoomed-in (300mm) picture 3 you can just see some of Jupiter’s moons beside it. Well ok this isn’t the night sky, but neither is the Moon necessarily or my pictures of Mercury. 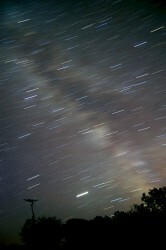 I was very lucky to get this, in fact I only managed to take 4 pictures and had to judge exposure time from that. The cloud was expected and that it would make a more interesting picture, but we nearly had too much to get any pictures at all. 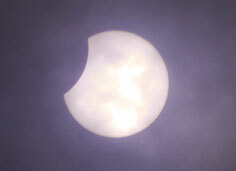 I did see the full solar eclipse of 1999 but under cloudy conditions and with no camera. This picture was taken with my D50 DSLR through the Nikkor 300mm lens, using a homemade Baader solar film filter (see the Astro page for more info). Since the Moon only covered about 22% of the Sun it would have been impossible for anybody to view this without protection, there was no noticeable dimming of the daylight either so the majority of people won’t have known it was happening. Now that I am fairly familiar with the technical procedure of star trails I am concentrating on framing and composition, adding an interesting foreground can make a good image into an excellent picture. 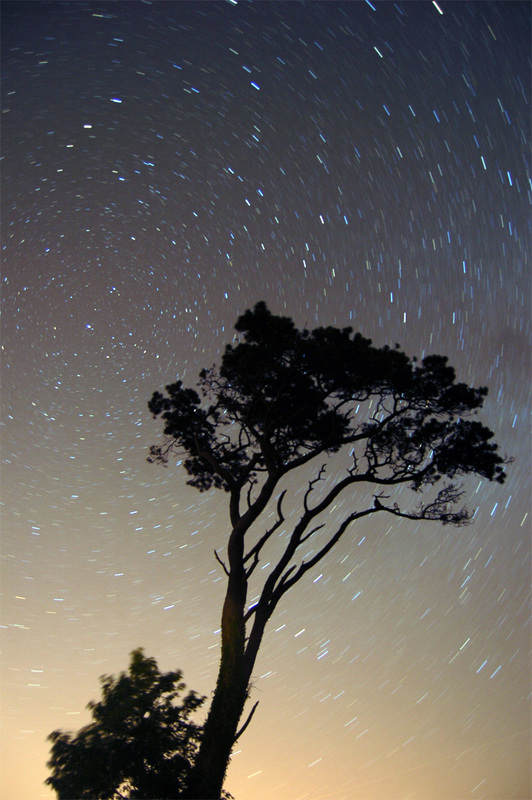 My closest dark sky spot has a lot of interesting trees so decided to try and use one. 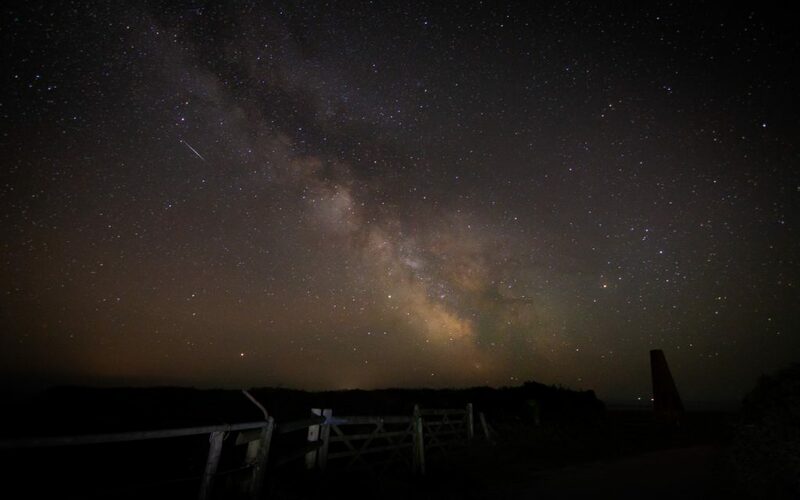 Our dark skies are best looking south over the sea, towards the Milky Way as seen below. 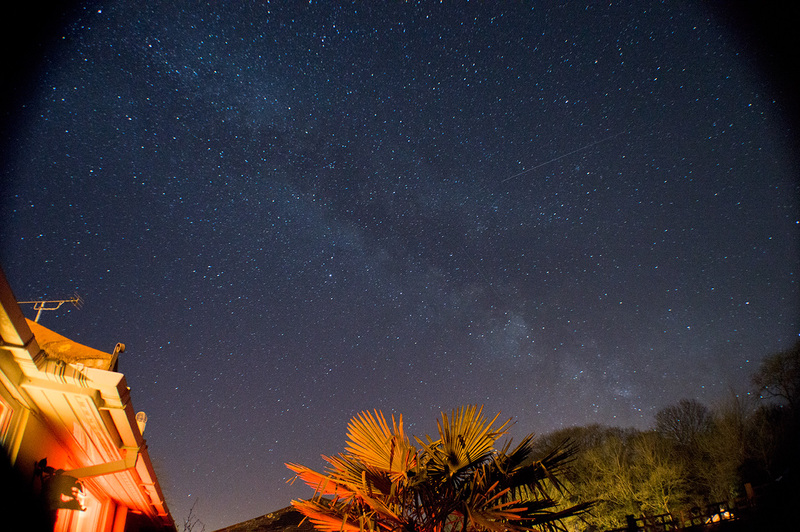 When you turn around to the northerly direction you soon get light pollution in your shots as was the case here. Photoshop is good as rescuing images but post-processing is never a substitute for properly dark skies. This picture was only a 7 minute exposure firstly because it was supposed to be a test image; but also because I knew it was going to collect orange sodium glow from Torbay and beyond. Fortunately it turned out ok because my main shot ended up collecting a lot of dew which ruined that longer exposure. Another negative to this image was that it was a fairly windy night; you can see the movement in the tree; especially bottom left. There’s lots to take into account to get the perfect picture. 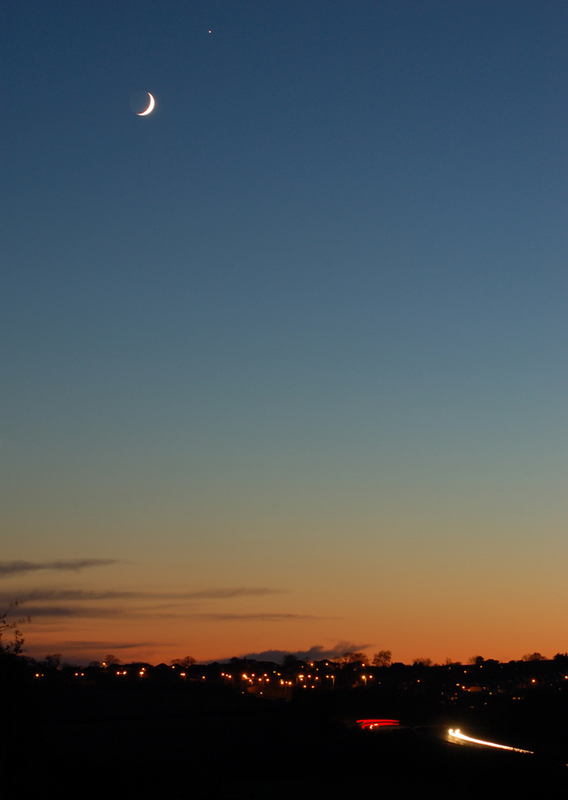 Finally, a decent clear night. 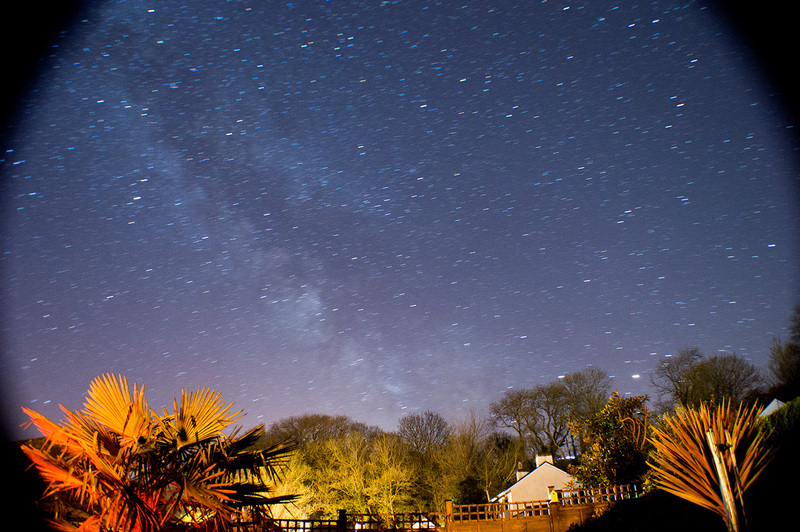 After weeks of cloud and hazy or misty skies I was treated to a super night sky – though had to venture out in the middle of the night for it. In the summer months we astronomers have to stay up very late to get to see the dark sky without evening twilight or the approaching dawn, I didn’t even head out until 1am. It wasn’t expected either so my batteries weren’t charged for a session of long exposures followed by noise reduction; both of which are battery intensive. The result was that the second shot didn’t even get to complete its NR and thus ended up with lots of hot pixels and bad CCD noise in one corner. Both images have had plenty Photoshop work but the second required a heavy session of treatments including dark frame reduction and manual healing brush work to reduce blotches. 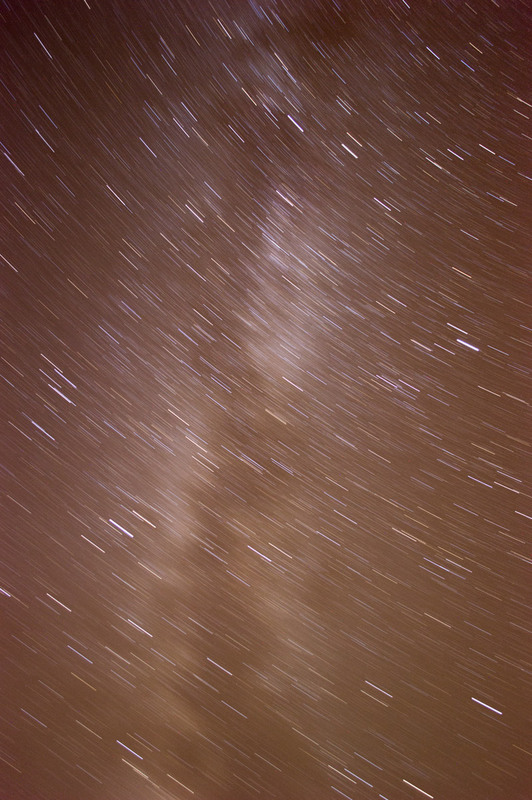 I think this ended up worth it since the Milky Way is very cool to see, even when trailed like this. 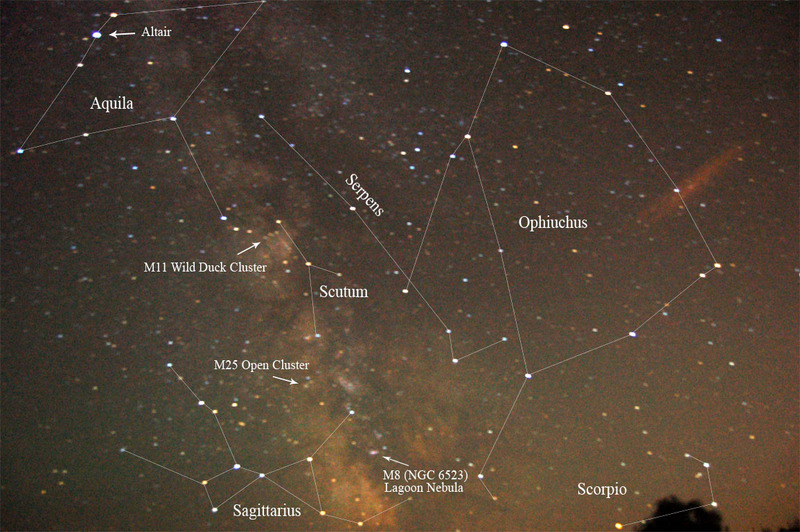 While the camera was busy taking the exposures I was scanning the southern sky with my binoculars; many of the nebulae and clusters are easily visible. The bright object at the bottom is Jupiter, through the binoculars I could see 4 jovian moons which I never expected. The first image was 8.5 minutes at my minimum f-number of f3.5; 18mm, ISO 200. 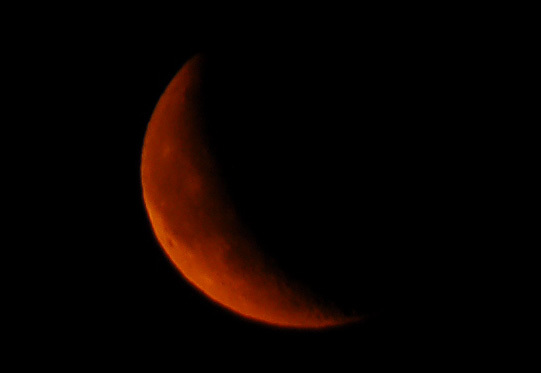 The second image was nearly 14 minutes with the same settings but taken at a darker location, though the lighter colour is more from the processing. 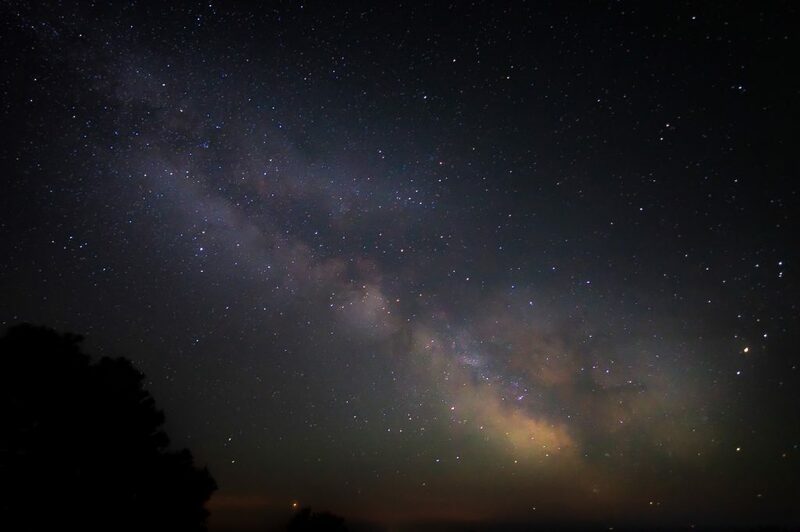 Next time I will try to get a better foreground to frame the band of the Milky Way, it just not easy to see what you are taking in the pitch black of night. 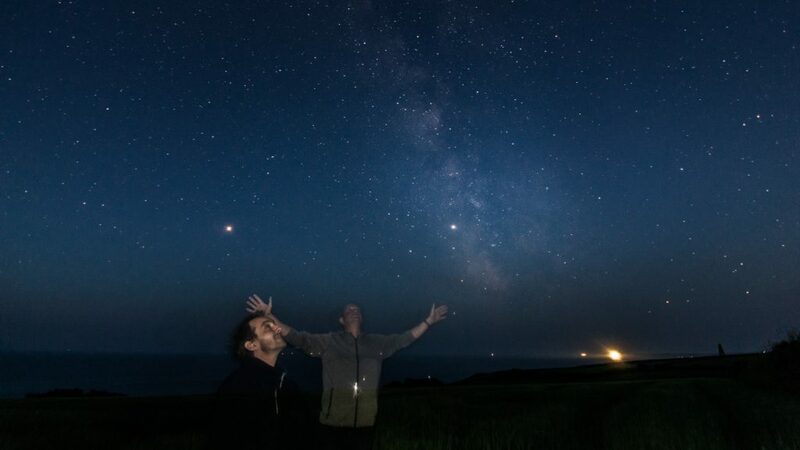 So far this summer we have had no proper clear sky nights and it’s been getting us down, so seeing a partly clear night myself and a friend headed up to our dark sky spot for a look. The seeing was pretty crap but it was a nice warm night for it and a pleasant trip. 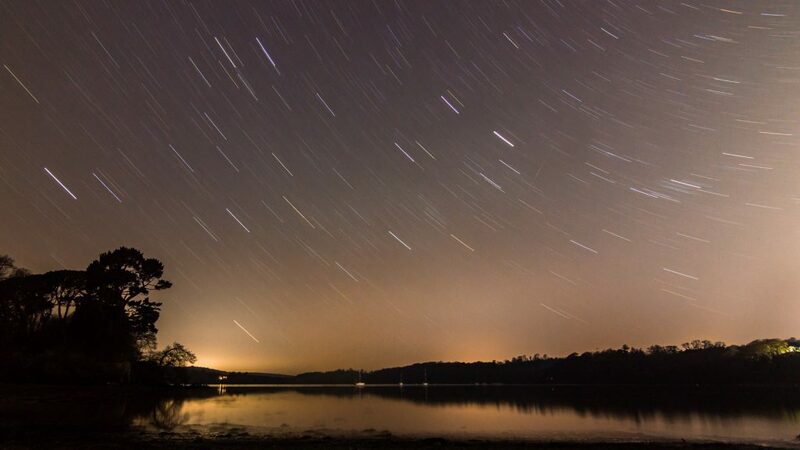 I’d setup for a long exposure overlooking a pool of water; trying to get star trails mirrored in the water, and also trying the work-around method of getting raw unfiltered pictures out of my Nikon D50 by switching the camera off while it is doing its noise reduction process. If anything I’ve learned just how noisy it would be without that! Though the idea is that you take dark frames to subtract later which I didn’t bother to do on this occasion. Anyway, I was gazing at the stars with the camera open beside me when I noticed two very bright objects moving upwards from the southern horizon, I got the binoculars on them and could see both in the field of view. We watched them for a while and they started to dim to the naked eye, though they were both still visible in binoculars for at least a minute or so. We speculated that they could be the ISS (international space station) and perhaps the space shuttle which had just launched the day before, then upon returning home I brought up the Heavens Above website which confirmed we had been right. Then to top it off I looked at my photos and realized I’d caught the moment, though with terrible noise issues. Some photoshop work took away the worst and here it is. I’d never seen Mercury before so this was a chance I couldn’t afford to miss. This tricky to observe little planet was within 2 degrees of a first day new Moon which made it an interesting subject for photography as well as assisting in locating the dot of light in the first place. Since the innermost planet is only about a third of the radius of our planet, and resides right next to the Sun, Mercury is harder to see than planets such as Saturn, Jupiter and Mars which are bright naked eye objects at night. I’ve just got a pair of Bresser 10×50 binoculars which got us the first sighting of the thin crescent Moon, then shortly after Mercury became visible in them as well. I hadn’t taken the telescope down since I didn’t want to carry it all down, however the following night I did take my scope down just to say I’d seen it, this wasn’t particularly exciting and to be honest I thought the DSLR pictures here revealed more detail than we saw through the scope! Around 30 minutes after sunset the pair were visible with the naked eye which made a really nice twilight scene over the River Dart. I’ve been concentrating on framing my pictures better so I walked around trying to line up foreground objects such as the trees to make a more pleasing image. Equipment used: Nikon D50 with Nikkor 300mm, if you are interested in the details (F-stops etc) then please download the larger images and view the advanced file properties, the full pictures are half the size of the originals which means they don’t show quite as much detail as in the full resolution versions. 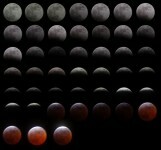 I’ve seen a few lunar eclipses now and while they aren’t quite the same spectacular event of a solar eclipse they are still an awesome sight. We stayed up way past our bedtimes to see this one; and watched the cloud cover up the full Moon just before it started, but thankfully the cloud cleared to reveal the last thin slice of the crescent just before totality. On this occasion I’d say the crescent phase was the most pleasing to the eye as the disc didn’t light up red as I’ve seen before, I came home just as totality was ending and watched the bright light creep back over the side into the last crescent phase of the eclipse. I didn’t go to any great lengths to photograph this one but I had to at least record it somehow; this picture is a composite over the top of an image when the Moon happened to be sitting in between the gap in the trees. So the central Moon is real and was in the same exposure as the blurred foreground of trees, the top images were taken at various times when the cloud allowed; starting with an image of the full Moon just before the eclipse started. Always a humbling experience and I can’t wait for the next one in 2010. 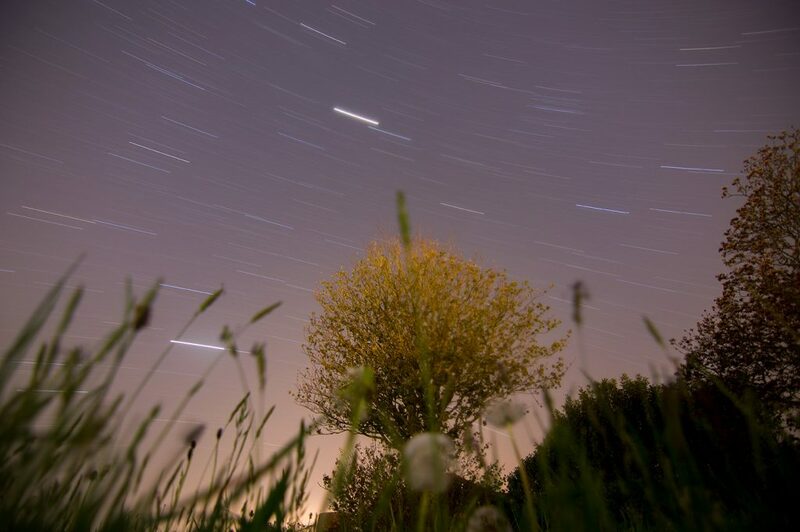 It is the week of the Perseid meteor shower so I’m opening the shutter as much as I can in the hope of catching one or more meteors or fireballs. I’ve seen many over the last few days but not when I’ve been taking pictures! 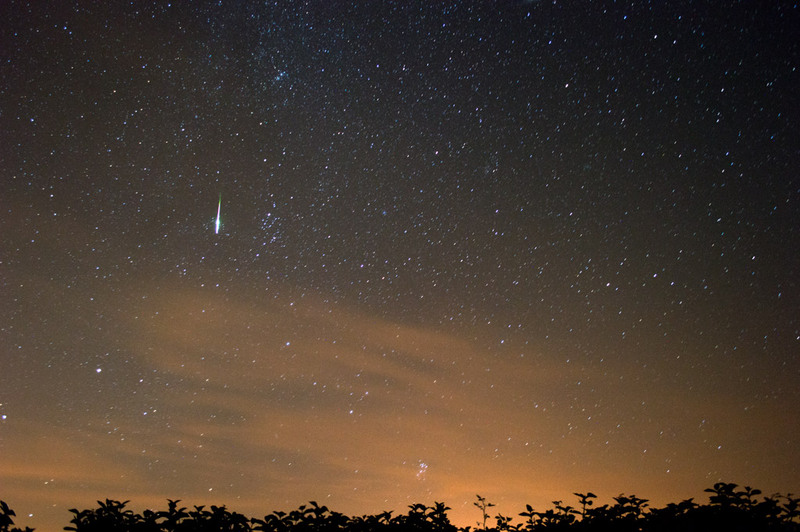 The fireballs I’ve seen this week have been tiny and slow; or long and fast; or any combination, often leaving a trail of smoke behind them for a second or so. Not going in any particular direction or in any specific area of the sky. Tonight (Friday) and tomorrow night are the peak of the shower so I’ll be out trying again. 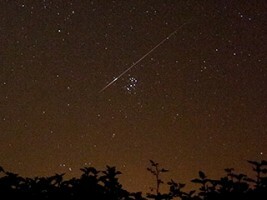 So, this picture was intended to catch a shooting star or two but failed! 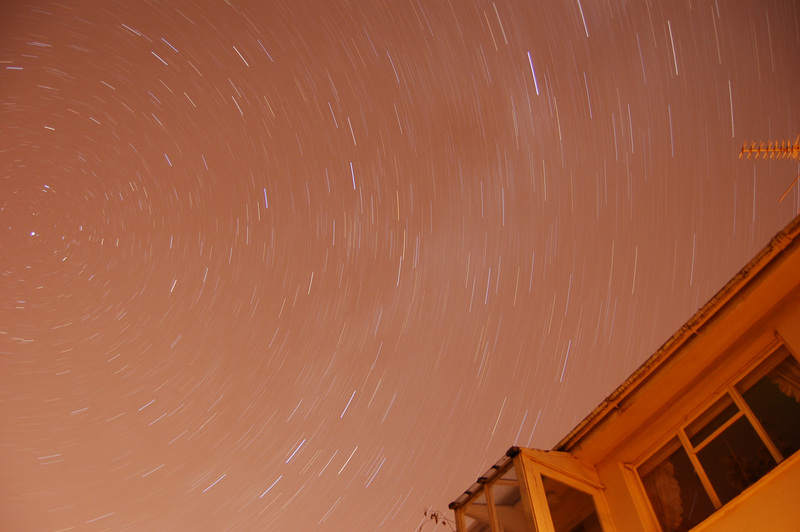 However it worked out as a fairly nice star trail with good focus and a good frame with the house and the North Star in shot. 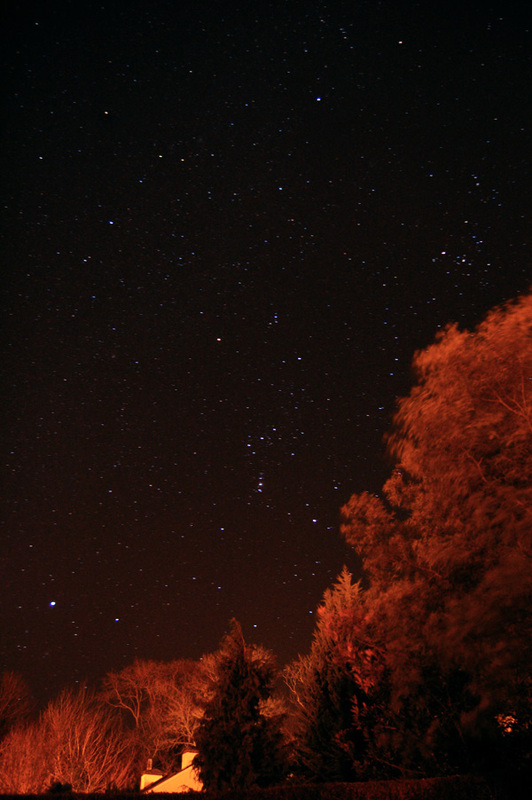 This is straight from the camera as leveling didn’t seam to make much improvement, its obviously very orangey red due to street lighting and about the maximum time I could do without it being ruined by the light pollution. Just the D50 at 18mm F3.5, ISO200 to keep the quality high, for just over 20 minutes. The larger version of this pic has been cropped down to save filesize but if you look carefully you can see little dark dots scattered around the image; this is a digital noise artifact caused partially by the camera not being at thermal equilibrium (the same temperature) as the air around it (hadn’t given the camera a chance to cool down first) and also just the typical noise you may expect from a mid-priced digital SLR when exposing that long in one go (rather than stacking multiple images). 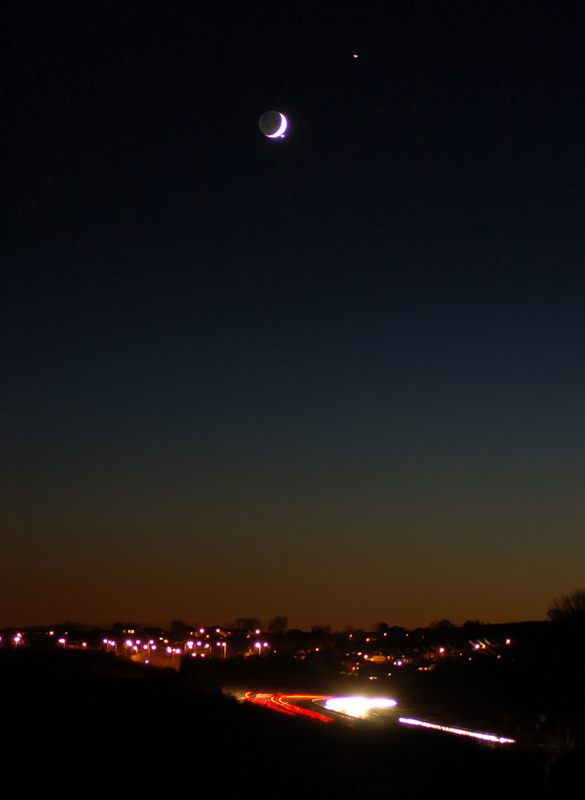 I was driving home from a friends place when I spotted this gorgeous red crescent Moon just coming up over the sea, luckily I had my camera with me and headed down the the beach to try a picture. The downside was I didn’t have my tripod so I had to put the camera on the top of a wall and prop the lens up with my mini torch; this worked quite well considering! At least you can see the colour which to the eye was a glowing orangey red type effect. This image is basically straight from the camera except one application of sharpen in Photoshop. Nikon D50 with 300mm F5.6 Nikkor lens triggered from the remote while resting on a wall! After some problems with the telescope and tracking we decided to try one last long exposure as a test; the North Star (Polaris) which never fails to give impressive tunneling effects; but this time with a star filter attached. This was a joint effort between myself and Steve who had the filter and holding bracket that screws onto the end of the lens. Star filters are very common in astrophotography, from amateur photos to Hubble; look out for those tell-tale spike’s coming off the brightest stars. I can see I’ll be using one of these a lot in the future. 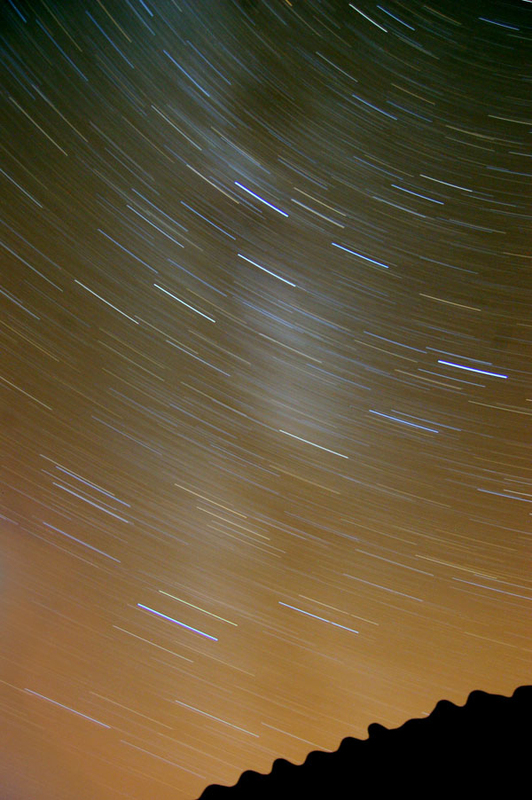 This was one 20 minute exposure at 70mm which is the max wide angle for my 70-300mm lens. I spent a lot of time making sure the focus was right which is essential for getting anything decent, I’ve now ordered a right-angle viewfinder for my Nikon which also boosts the view by 2x to make focusing a lot easier. Again I have done a lot of work with Photoshop levels to make the best of it. 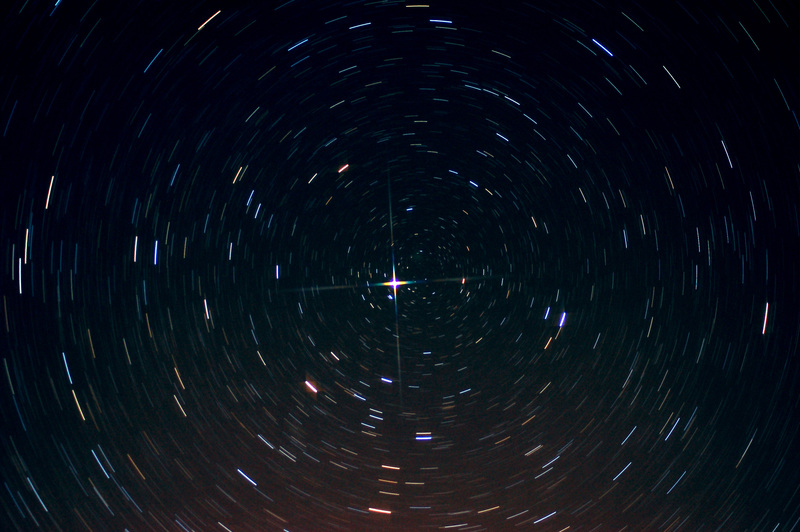 I personally really like this shot, take note of the fact that the pole star is not actually at the celestial center, the proper center of the tube effect is a little to the right; this is the position of true celestial north. It’s not every day you get a full lunar eclipse so we took the opportunity to have a little eclipse party at my place. 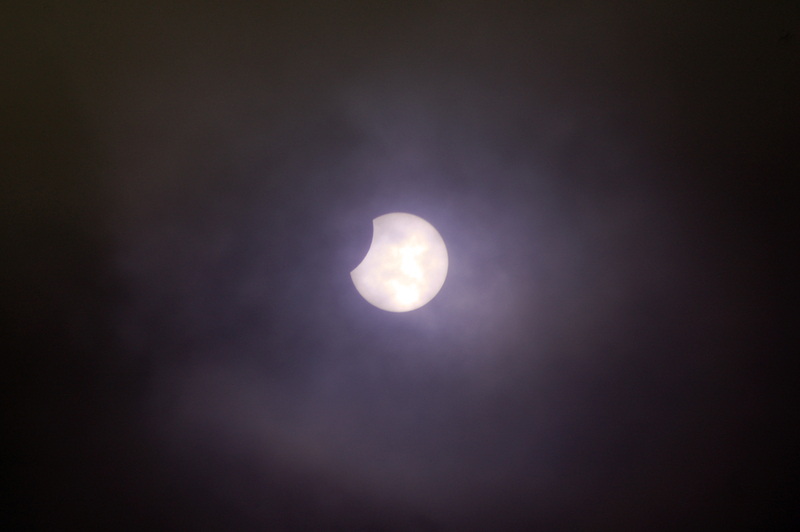 The weather was great until during totality when the cloud started blurring the view. I had intended to get a video timelapse of the event but this ended up a disaster due to software problems and was generally a difficult task to attempt anyway. Myself (D50 with 300mm Nikkor AF Lens) and Steve (D100) set up our Nikon’s on tripods hoping to get enough shots to make a sequential picture or animation from them. The obvious factor is that the longer the exposure necessary; the more motion blur there will be (due to the Moon moving across the sky). The first shots are taken with an exposure of several hundredths/sec but as the Moon got dimmer I ended up at several seconds per shot which makes for blurry shots. I wanted to keep the telescope handy for casual viewing of Saturn etc so opted not to track this time; next time (Feb 2008) I will use the telescope and tracking to get sharper images. 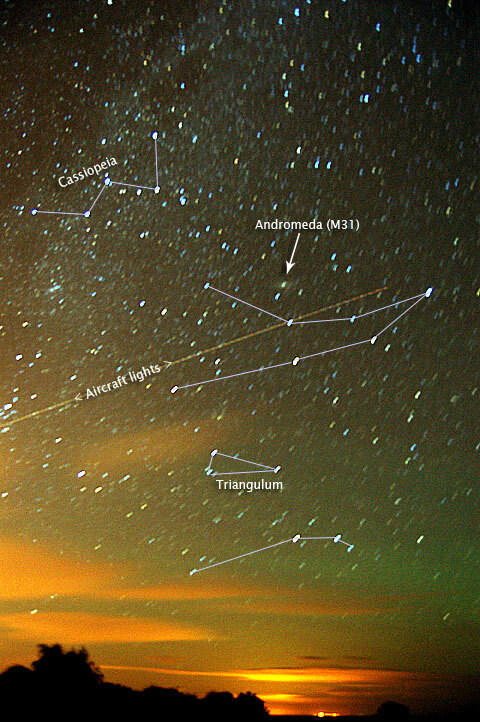 Our new location for observing the skies makes a lot more subject matter available, again I have done the north-eastern skies and drawn the constellations over the top to show the proximity of the Andromeda galaxy, I find it quite easy to find even with the naked eye now. 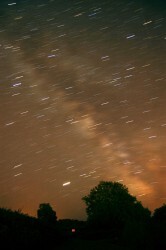 The second shot is taken looking the opposite direction; SSW towards the center of the Milky Way. I tried shorter exposures this time to reduce the trailing effect. 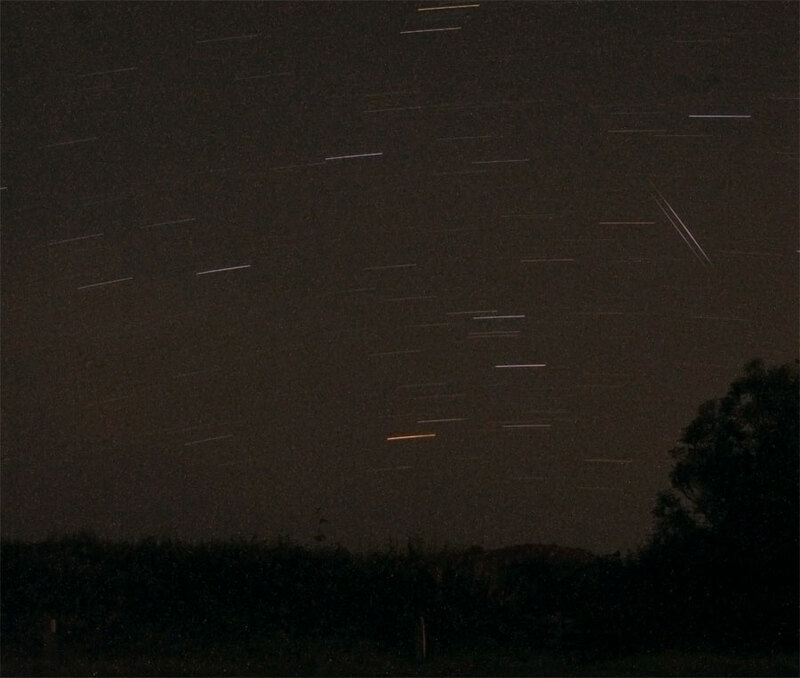 The Perseid meteor shower was good to watch but not so easy to photograph. I did try a few long exposures in the Perseus direction but found that fireballs never happen where/when you want them to! My 300mm Nikon lens at full zoom gets a pretty good view of the Moon, not bad considering that it is quarter of a million miles away! These pictures have had very little editing except maybe a slight exposure tweak or an application of ‘sharpen’ from Photoshop, I find that you either got it right or you didn’t. As the Moon is a static easy target you can snap away at different settings and pick the best one later while learning along the way. It’s also worth noting that I raised the brightness settings on the camera’s screen to match what I was seeing back on the computer screen, after a few days of using the camera I felt it was giving me an inaccurate idea of what the shot looked like; now I trust it and don’t have to worry. Just wanted to say what beautiful images these are and to thank you for letting us see them. If you wish to use any of my images please give me a credit: Chris Harvey (flitemedia.com).